Had we ever guessed the historical importance of this day, had we expected the impressive and touching episode of German history that took place on November 9, 1989, had we dared to hope that a dream three decades old would come true on precisely that day, we would have held our symposium in the immediate vicinity of the Branden­ burg Gate! While it is difficult to describe the atmosphere on that evening, when the news suddenly spread that "the wall had opened", it is almost impossible to describe the feeling of fraternity and sense of belonging that overcame everyone, a feeling that had been repressed (but never suppressed) for three decades! Berlin M. BROCK H. M. MAYER K. WEIGEL Contents Introductory Remarks M. BROCK, H. M. MAYER and K. WEIGEL. . . . . . . . . . . . . . . . . . . 1 . . . . Functional Anatomy of the Lumbar Spine R. LOUIS (With 4 Figures) . . . . . . . . . . . . . . . . . . . . . . . . . . . 3 . . . . . . . . Implant Materials H. STALLFORTH, W. WINKLER-GNIEWEK and M. UNGETHUM (With 4 Figures) . . . . . . . . . . . . . . . . . . . . . . . . . . . . . . . . 13 . . . . . . . . . . . 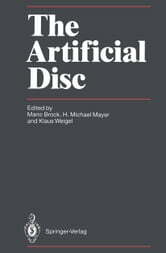 Performance of Alloplastic Materials and Design of an Artificial Disc H. J. SCHMITZ, B. KADEN, R. T. FRITZ, U. GROSS and G. FUHRMANN (With 9 Figures) . . . . . . . . . . . . . . . . . . . . . 23 . . . . . . Intradiscal Implants in 1989: Concepts and Possibilities J . A. N. SHEPPERD (With 4 Figures) . . . . . . . . . . . . . . . . . . . . . 35 . . . . . . . Intradiscal Polymerization: Preliminary Results of Chemical and Biomechanical Studies A. GARCIA, B. LAVIGNOLLE, P. MORLIER, D. DUCASSOU and C. BAQUEY (With 2 Figures) . . . . . . . . . . . . . . . . . . . . . . . 39 . . . . . . . Intervertebral Implants for Fixation and Disc Replacement J. A. N. SHEPPERD (With 6 Figures) . . . . . . . . . . . . . . . . . . . . . . . . . . . . 45 Lumbar Interbody Threaded Prostheses C. D. RAY (With 5 Figures) . . . . . . . . . . . . . . . . . . . . . . . . . . . . . . . . . .